Here it is! This was a quick project. I enjoyed printing my own fabric and imagining a finished project around it. Designing your own fabric has gotten so accessible that anyone can do it. You can even print it at your house. Yay technology! – It helps to have the right equipment so you don’t end up knocking on a friend’s door in search of a color printer at the last minute. – It helps to have good friends. – With advances in technology and the vast amount of supplies available to us, we really can make anything our imaginations can dream up. Go create! Next up: a guest series from an intrepid friend. Are you ready? 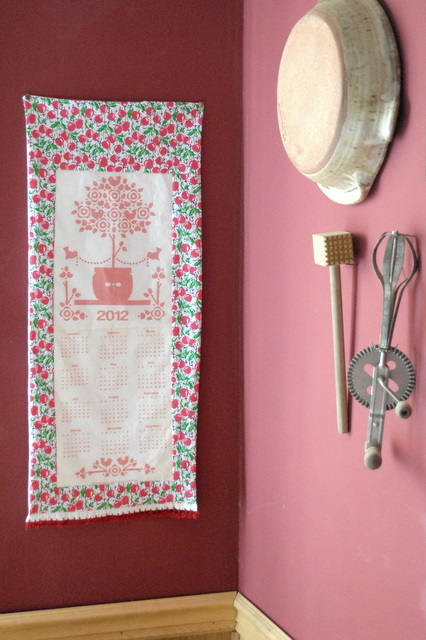 Once I had my printed fabric sheets for the 2012 calendar I needed to decide what to do with them. I had considered making it into a tea towel, but the texture of the printable sheets wasn’t quite right for that. I picked up some absorbent fabrics to go with it but ended up choosing to make a wall hanging instead. Above you can see my supplies: flour sack towels, cotton flannel with a cute cherry pattern, some red crochet floss (my favorite part of the finished hanging), some red ribbon, and sewing stuff. I didn’t take any photos of the sewing process, sorry. Mostly I just cut a flour sack towel in half, measured flannel for a border around the calendar to match the size of the towel, pieced the front together, sewed the back on, and pressed it all flat. Ta da! Check back tomorrow when I’ll show you the awesome detail I added to the bottom. You can see that they frayed a bit but overall they turned out pretty great. It occurred to me after I finished the project that if I wanted to do multiple versions of the calendar I could have used a service like Spoonflower. 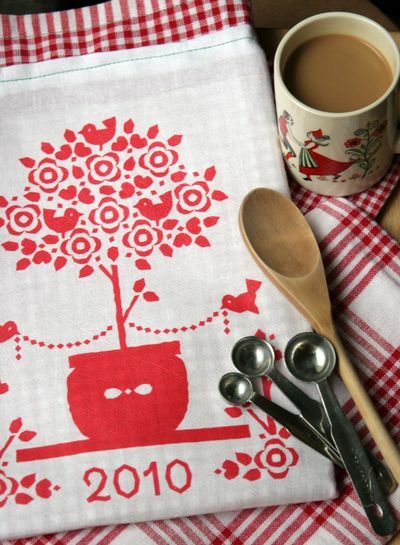 Spoonflower is a local company that does print on demand fabric. You can create anything you want. It’s kind of incredible. I might still give it a try. Check back tomorrow to see all of the materials I bought for the calendar project. 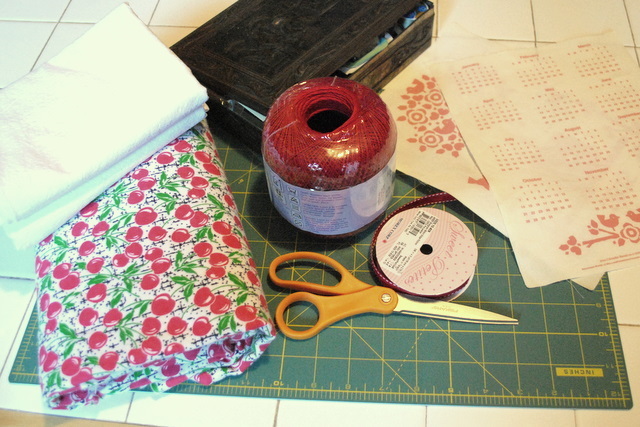 Craft blogs have been a great source of inspiration for me during the course of this blog project. Recently a project came across my blog reader that showcased the talents of two of the crafters I read regularly. 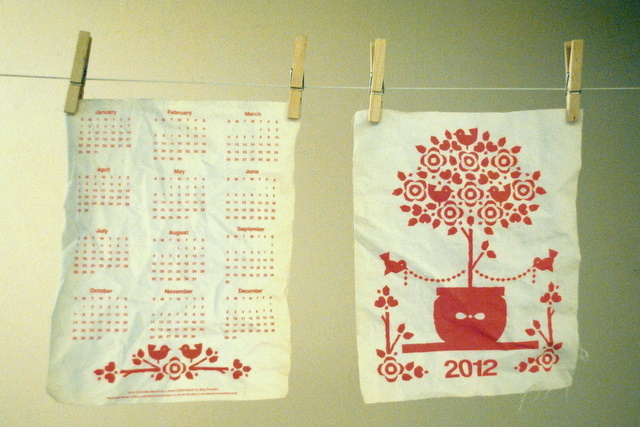 Check back tomorrow as I try my hand at this printable 2012 calendar tea towel. I finished it in a day, so if you hurry you could make one before the end of the year, too! Project 19: Window treatments are done! Huzzah! Can you believe the roman shades are done and hung up? I kind of can’t. I felt a bit like Dr. Frankenstein a few minutes ago standing on my bed with the power drill. When they were up I just kept raising and lowering them with a foolish grin on my face. They work! They’re done! And I made them! I can barely believe it. – Baby naps are a perfectly reasonable time to get things done, even things involving power tools. That’s all I’ve got for now. It’s too close. Many thanks to Dara of Li Sashay for the help with the shades, and to my husband for digging tools out of the utility room at 1:45am. I couldn’t have done it without either of you. Next up: finishing the lights. I finished my curtains! Last night I finally had a free hour to finish sewing the tabs on and get them hung up. You can see that the color isn’t a perfect match with the rest of the room, but I’m so happy to have them done that I’m not too concerned about it at the moment. Next I’ll work on the roman shades and hopefully get those done tonight. Stay tuned! This is Dara. She is the creative genius behind Li Sashay, a local clothing design company. She generously offered to collaborate with me on my roman shades as part of her 40 Days of Summer project. We met in the sewing room at TechShop last night to tackle my giant bolt of white cloth. She knows way more than I do about sewing! Every so often she’d say something (ex: “I have twill tape”) that made me just stop and stare at her like she was speaking a different language. Thankfully she was a patient instructor and made allowances for the fact that I have no idea what I’m doing, even cheerfully ripping out a whole 8 foot row of my stitches that had wandered around a bit too freely. She ironed, pinned and fixed the sewing machine while I did my best to sew straight lines and get the roman shades done in our time together. Check out this beast of a machine we used! This project was featured as part of Li Sashay’s 40 Days of Summer projects.